Introducing an effective NATURAL hand cleaner that is world's apart - it's naturally harmless for our bodies and also naturally good for our planet. Years ago, all that was needed was a simple form of 'soap' for washing - but these days most manufacturers add various harsh chemicals to make their hand cleaners more effective, and it seems that more and more people are finding that they cannot tolerate certain of these chemicals which can cause nasty side effects. You only have to read the labels on their products to see the problem. We sometimes forget that skin is porous, and thus what we put ON our bodies ends up IN our bodies. 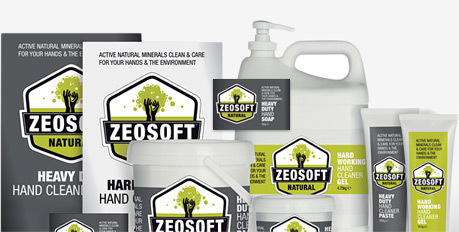 Zeosoft from ultra-green New Zealand offers a one-stop solution - a unique NATURAL product which does everything you might need it to do, harmlessly. Non-toxic, safe and biodegradeable, Zeosoft contains the natural mineral Zeolite, from the Rotarua valley in New Zealand. In outside catering, we often handle garlic, chilli and other pungent herbs and spices. Since using Zeosoft, not only do my hands feel softer but all residual smells have completely gone and I love the slight scent of lemon grass left behind. Also, when on location, hot water is not always to hand, so the fact that it works in cold water is a real bonus! Cleans ALL dirt and ingrained stains (oil, fuel, paint, marker, garden, hair and food dye, etc etc) from hands and other parts of the body. Absorbs and removes ALL odours left on the skin from dirty jobs such as, cooking, fishing and many more. Exfoliates rough skin and, through it's natural ingredients, aids healing for blisters, nicks and cuts. Works anywhere, and is equally effective in hot, cold and salt water, so is also ideally suitable for camping, farming, angling and all other outdoor pursuits. 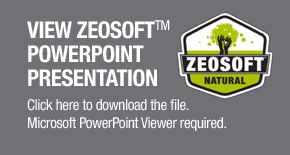 Try Zeosoft today, you won't be disappointed. Running a busy Tearooms, making our own scones, lasagnes, soup etc, I am always ‘nicking’ my hands with sharp knives. After trying Zeosoft for 2 months, not only is the natural Tea Tree Oil antiseptic seemingly healing my ‘nicks’ faster, but my hands are no longer rough and now always smell nice. Our endorsements prove that Zeosoft is loved by hard working housewives, muddy children, engineers, mechanics, fishermen (as Zeosoft is harmless to fish), household gardeners, landscape gardeners, painters, decorators, plasterers - people who suffer with rough hands, chefs and cooks, nurses, vets, sportsmen, trawler-men and sailing enthusiasts. 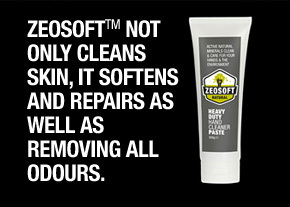 Available in various sizes of container in a bar, gel or paste, Zeosoft is suitable for literally anyone, of any age. And now it is manufactured under rigorous controls in the UK - it is very price competitive, and you don't need to use a lot of it to gain the benefit. For the household we offer a highly effective bar, or 300gm tubes of Hard Working gel (suitable for most tasks) or Heavy Duty paste (for gloss paint and other heavy skin soiling). For the larger household or business, we also offer a variety of dispensers (either pump or wall-mounted, please contact us for details of the full range and quantity price breakdowns). Commission agents currently required across the UK.